This project entailed the overhaul of a government agency website in less than five months. Our team consisted of only myself, another writer and a designer. Looking back, I can hardly believe we met our deadline. The current website for the Department of Design and Construction. In 2014, Mayor Bill de Blasio took office and initiated change across New York City’s government agencies. The Mayor appointed a new Commissioner for the Department of Design and Construction (DDC), and I was soon tasked with leading my team in migrating the agency's website to a new instance of TeamSite with an updated front-end design. DDC manages the design and construction of all public buildings and infrastructure in New York City. The agency’s website must serve many different people; a website visitor might be a resident who’s wondering why their water was shut off. It might also be the owner of a small construction business searching for contracts and forms. We identified our potential website visitors as constituents, government officials, journalists, business owners, architects and designers, DDC staff, and job seekers. My team discussed these potential visitors and mapped how a new website could meet their needs. Here's what we had to update—the old DDC website, designed in 2002. The first mock up I made of our redesigned website, complete with feedback I received from our Commissioner. 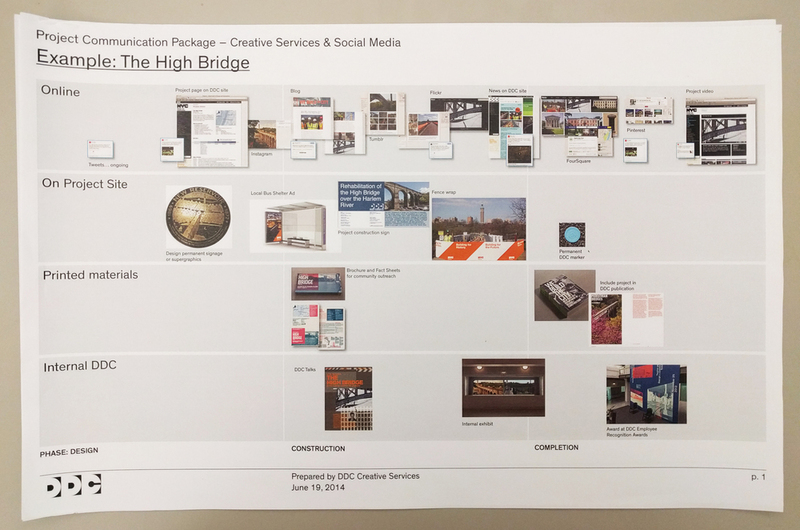 I worked with our Creative Services team to develop this early idea of how the story of one DDC project—our recent reopening of the High Bridge—could be delivered across several different digital and analog platforms. We didn’t have to start from square one. New templates for the New York City's agency websites were developed by Huge during the final year of Mayor Bloomberg's term. Our first decision was whether to use this template or develop the site from scratch. We opted to use the template—it was time-efficient, low cost, and fell in line with the City’s overall digital footprint. In our research phase, we looked at a sampling of equivalences—websites of other government agencies around the world whose work parallels DDC’s. We reviewed how these cities delivered information on key issues that are important to New York City’s government: community services, client services, economic development, inclusiveness, resilience, responsiveness, urgency, and sustainability. This research gave us an idea of where DDC stands on an international plane, and informed how we could improve our information delivery. The research was later incorporated into a communication strategy delivered to our Commissioner. I performed a full content audit of our old site and assigned each page an OUCH status (out-of-date, unnecessary, current, have to write). I also organized stakeholder interviews with leaders of each division in our agency to understand their digital needs. These needs were radically different. Our legal team wanted the ability to post all contract documents online (something we addressed separately), whereas our Community Initiatives division wanted a blog to showcase their stories. In total, we assessed the needs of nine divisions. We hit upon the tagline of "Building for you." The DDC staff, which represents over 60 countries, helped us with translation. See the full video here. Website content was rewritten using the the City of New York’s Guidelines for Clear and Effective Communication. Sometimes it’s not easy to stick with this guide; as the City's capital construction agency, we have legal text that we aren’t always permitted to change. We did our best to convince others of the power of short, direct sentences. Our Creative Services division was simultaneously tasked with rebranding the agency. It was decided early on to bring our agency’s logo in line with the branding designed by Wolff Olins. We worked together in several planning sessions to develop a new tagline and vision statement. I also assisted in user testing several versions of the new logo. Our rework of DDC's homepage. Each month has a theme reinforced by original content. This is our mock up for July, which is about how DDC approaches smart energy use. I selected the photos, created story ideas and copy. An example of a Page One story idea and how it could incorporate many of DDC's projects and staff. The website and agency rebranding launched in September of 2015 during our annual Employee Recognition Awards. I worked closely with the Department of Information Technology and Telecommunications (DoITT) to time it so that when staff returned to their desks from the event, their browser homepage, automated PC wallpaper and telephone home screen were refreshed with the new look and feel. As we neared the finish line, we also expanded our team with three new members. It was tough to interrupt our work to conduct interviews, but it was worth it. Our team was one of my favorite parts of working at DDC. The DDC website is supported through TeamSite, a content management system owned by Hewlett-Packard and contracted by the New York City government. I've worked with several different CMSes, but this one was completely new to me. Through a little training and plenty of trial-and-error, navigating TeamSite is now second nature. In response to our Commissioner's desire to tell more agency stories, we launched the rework of DDC’s homepage—an idea we called Page One. Much like a magazine, each month will have a theme. These themes support the Mayor’s goals of equity, sustainability, resilience and growth. We started in July of 2015, showcasing how DDC is a leader in addressing energy consumption. Our first story goes went inside Green Asphalt, an asphalt plant working with DDC to develop the nation's only 100% recycled paving material. For all of our Page One stories, I acted as editor-in-chief, assigning and contributing relevant stories to populate DDC's homepage.